A brand new tale in the world of Monkey Island is coming out, and I'm hoping for a fun old style adventure game in the vein of the classic genre. I went ahead and prepurchased all five episodes, and can't wait to delve in. But, before starting to play episode one, I decided to refresh my memory on that which came before. I started at the beginning in Secret of Monkey Island. As with Monkey Island 1, I have Monkey Island 2 on 3.5" floppy disks. I was able to get the game files, and install them using the included installer. The installer believes that you are installing from a floppy drive, not a hard disc, and there is not an easy way to switch discs during the install. I addressed this by putting all the disk files in a single directory. That way I only mapped one drive to the folder with all the data files and the install was off and running. To run the game, I went straight to the SCUMMVM software that I used with Monkey Island 1. SCUMMVM is a tool for running old games, as long as you have a data file. It is named after the SCUMM engine which was used to create the original Maniac Mansion, Monkey Island, and other LucasArts titles. One of the great things about SCUMMVM is that you only have to enter the copy protection on the first run. After that, the game goes directly into "restore" mode and lets you jump into a saved game without having to go through the copy protection again. The bad thing about this is that, if you want to start the game over, perhaps to choose the "lite path" there isn't a way to do it. I ran the game, quit the game, and ran the game again to start over from the beginning. I have no idea why that worked or if there is a hidden "restart" key in the game. Do you know any songs that are not about my ex-Girlfriend? 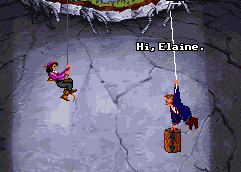 The story starts out with our Hero, Guybrush Threepwood, on Scabb Island. He is once again bragging about his victory against the Ghost Pirate LeChuck; while letting us know that he wants to find the treasure of Big Whoop. He gets mugged by Largo LaGrande, a bully on the island and is stuck pennyless looking for a way to free himself from Scabb Island. Since Guybrush can't leave, Scabb Island is a great consolidated way to introduce us to the game mechanics. Guybrush will walk around and talk to people, looking for information on Largo and Big Whoop. The Voodoo Lady pops back up to ask for help creating a Voodoo doll to destroy Largo. You just need four things to create a voodoo doll; something from the dead, something from the thread, something from the head, and something from the body. Get those for things from Largo, and you can attack him on his own terms. He'll leave the island, but not before stealing LeChuck's beard from Guybrush, thus creating the Zombie Pirate LeChuck. When did that beard get into Guybrush's inventory? So, now LeChuck is alive, sort of, and after Guybrush. What is he to do? The Voodoo Lady tells you to find the map to the treasure of Big Whoop. I remembered a lot more of this game than I did the previous one, and got through it with only a single hint near the end. You'll Charter a ship and start to investigate the tri-island area. Booty Island is in constant Mardi Gras; and Elaine is governor and you get to go to a costume party. Phatt Island is less fun, and you end up in jail for a bit. There is a lot of travel between islands, especially if you don't know the solutions already. The game makes great use of multiple locations, and keeps them consistently interesting. Eventually, you'll get a bunch of map pieces, visit LeChuck's fortress, then go onto Dinky Island to get Big Whoop and a final battle with LeChuck, loaded with Star Wars references. The game has an easy path, for game reviewers or beginners, which bypasses most of the puzzles. I never played this route before, but decided to partake in it for the purposes of this review. After playing the game the hard way, this approach took a few hours to plow through. It is an abbreviated version of the game, but you still get the gist. The puzzles are either cut out, or bypassed. Instead of chasing a map piece all around an island, you just pick it up. Instead of becoming a spitting master, you just ask for help and the puzzle goes away. I think this was a brilliant approach that helps make the game more accessible to beginners to the adventure genre. If more games did this, maybe we'd have a larger populating of adventure gamers. If Sleepaway Camp has the most shocking ending in the history of horror movies, Monkey Island 2 has the weirdest ending in the history of video games. It is unclear what the meaning is, and unclear how Ron Gilbert intended to resolve the story. Future Monkey Island game designer's tried to resolve it, each in their own ways, but none so satisfactorily that we still don't yearn for the secret that still lies in Ron's mind. At the time of this writing, the second episode of Tales of Monkey Island was just released, and I'm still two games behind before I start playing the episodes. I always forget if it is Curse or Escape that comes next; but I plan to play the third game next, whichever one that may be. Part 3 introduces a new designer, and the feel of the series changes a bit. But, I still remember enjoying them immensely. Hope all is well, I loved this game. Look forward to its release!